You will keep feautring one by one the plants found in Bundanon. You have written about a few others in previous posts, like Camphor Laurel, Fat Hen, Purslane and Poplars. There will be a brochure produced as a result of this residency, where some of those plants will be introduced. There are two types of Bamboo: clumping, which stay where they are put, and running, which are invasive and spread rapidly and vigorously, quickly getting out of control. Two common species of running bamboo, Golden Bamboo (Phyllostachys aurea) and Black Bamboo (Phyllostachys nigra), are declared C3(1)C4(14) in NSW and C4 in ACT (see explanation notes here). Bamboos have rounded woody stems: those of Golden Bamboo (5m) are yellowish, slightly flattened and grooved; those of Black Bamboo (8m) become shiny black with age. Bamboos rarely if ever flower; and thus do not produce seed. Running bamboos spread by means of long underground stems (rhizomes) which send up multiple shoots. 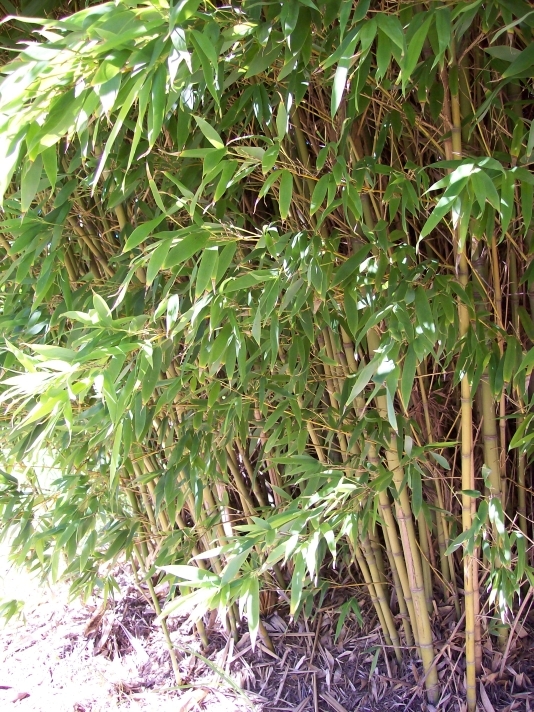 Bamboo is often dumped on bushland edges. Young shoots – cooked. They can also be eaten raw and have very little bitterness. They are said to be the sweetest of the genus. The canes are about 15mm in diameter. In China, the new canes are 2 – 5cm in diameter. The shoots are harvested in the spring when about 8cm above the ground, cutting them about 5cm below soil level. Seed – raw or cooked. The seed is only produced at intervals of several years, it can be eaten in all the ways that rice s used and can also be ground into a flour and used as a cereal. The canes make excellent plant supports and are also used for making items such as umbrella handles, walking sticks, fan handles and pipe stems. The canes are very hard but super-flexible. A fibre from the stems is used for making paper. The stems are harvested at any time of the year and crushed with a hammer. They are then cooked for 2 hours or more with lye and beaten in a ball mill for 4 hours. The fibre makes a yellow/gold to cream paper. This entry was posted in Bundanon, Recipe, Remedy, User Info, WeedyConnection. Bookmark the permalink.